As a result of the latest economic downturn, schools all over the country have felt the pinch. Budgets have been slashed, teachers laid off, and some have had to eliminate programs all together, particularly music programs and the arts. However, some music programs continue to thrive, despite the difficult environment nationwide. As Choral Director found out in a recent conversation with Brendan Jennings, his choirs do go big, so big as to be one of the inspirations for the hit television show “Glee.” That recognition landed Brendan and his advanced show choir, Powerhouse, a performance on the “Oprah Winfrey Show.” Brendan began his choral pursuits as a student at John Burroughs High School. Now he shares his passion with his alma mater and the next generation of singers. Choral Director: Why did you choose to become a choral director? Brendan Jennings: I became a choral director because I had an incredible experience as a student in the choral program at John Burroughs High School. In addition to amazing teachers and team experiences, I also had the chance to become a leader within the group, which gave me the inkling that I might enjoy becoming a teacher. When the opportunity presented itself to become an assistant at Burroughs, I jumped at it. Six years, a degree, and a teaching credential later, I took over the program that influenced my life. CD: What were the things that inspired you to take the path you did? BJ: Winning show choir nationals in my freshman year at Burroughs, being the California State Honor Choir in 2000 with Rodney Eichenberger, singing Verdi’s “Requiem” while a student at the University of Southern California, directing the men’s show choir at Burroughs while in college, working for one year as an assistant to a real estate broker in Los Angeles, and surviving my first year as a classroom teacher. : A real estate broker’s assistant, how did that job inspire you to become a music educator? BJ: What I learned from that experience was how tense and angry people get about their money. Dealing with adults was extremely taxing and stressful. Adults hold grudges; they have less of a capacity for trust. Kids haven’t hardened in that way yet. There was no joy in working with adults. I was very ready to go back to working with kids. : Where was your first teaching job? BJ: My first and only, official teaching position has been at John Burroughs High School. : When did you begin teaching? BJ: I began teaching in high school really as a section leader and ultimately student president of the advanced choir. I continued to teach as I founded an a cappella group in college and built it up over four years. While in college, I worked as an assistant choreographer and men’s choir director at Burroughs. The experience of getting 40 teenage boys to listen to me, most of who I had just been in high school with, was the best lesson in classroom management I ever could have had. : Being a student leader in school must have been good teacher training for you? BJ: It was, but I didn’t know it at the time. It was good to learn how to get in front of a group of students and hold their attention. It also taught me that you’re not always their friend. You have to be a leader. : Can you talk a bit about the accomplishments of your choirs? BJ: In competition, all of the Burroughs ensembles are consistently among the top in the country in their divisions. Powerhouse won large national invitationals in 2007, 2008, and 2009. Sound Sensations, the advanced women’s group, was undefeated in their 2010 season. All of the show choirs at Burroughs also perform as concert choirs studying music of every historical period. Works by Palestrina, Bach, Handel, Mozart, Lauridsen, Rutter, and Whitacre are routinely performed. In the fall of 2006, Powerhouse performed the Mozart Requiem in several concerts collaborating with the Center Stage Opera of Los Angeles. In the winter of 2008, Powerhouse performed Bernstein’s Chichester Psalms as part of the Burroughs Holiday Spectacular. More recently, Burroughs has been credited as one of the inspirations for the hit television show “Glee.” Powerhouse, the advanced choir, was featured on the “Oprah Winfrey Show” opposite the cast of “Glee.” Since then, students from Burroughs have had some wonderful performance opportunities: in concert with Foreigner at the Gibson Ampitheater, for a Konami press conference at the Los Angeles Convention Center during the E3 gaming expo, and for the Direct Seller’s Association 100 Year Anniversary Gala in San Francisco. : How did your program inspire the creators of “Glee”? How did they know about your choirs? BJ: The show’s creator, Ryan Murphy, was doing research and watched over 1, 000 show choir videos on YouTube. Apparently, he found our video, and we figured very prominently. I’m not quite sure exactly how much we inspired the show. But, now it’s been said by Oprah, so I guess it’s true! Incidentally, they shot some of the interior scenes for the pilot episode at our school. 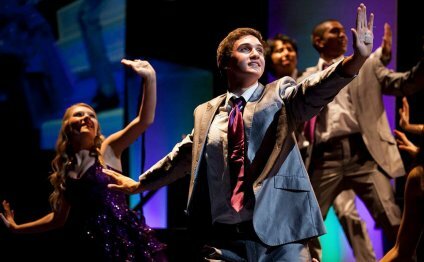 2008 John Burroughs Powerhouse - "The Show Must Go On HD"